PLEASE READ THE WAIVER BELOW. ALL PLAYERS ARE REQUIRED TO COMPLETE A WAIVER. PLEASE ENTER THE REQUIRED FIELDS LISTED BELOW. IF YOU AGREE TO ALLOW YOUR CHILD TO PARTICIPATE, PLEASE ENTER THE REQUIRED FIELDS AND PROVIDE YOUR DRIVERS LICENSE NUMBER AS PART OF YOUR ELECTRONIC SIGNATURE. That you are only authorized to use the WHIRLYBALL premises and facilities upon the proper execution of this document. That this document is a material part of the consideration and agreement between you and WhirlyBall for the admission to and use of its premises and facilities. That you have read this entire document and completely understand its contents. You also acknowledge that any questions about the content of this document or use of the premises and facilities have been answered by a representative of WHIRLYBALL. That you accept all responsibility for property damage to WHIRLYBALL’S premises and facilities caused by your actions. You also understand that the term “WHIRLYBALL’S premises and facilities” includes the premises, all fixtures in and around it, the surrounding parking area and the equipment associated with it. That you acknowledge that the owners and operators of WHIRLYBALL have employed diligent efforts and care in making the facilities and premises as safe as possible; and that despite the foregoing efforts, you understand that there are, nevertheless, certain inherent risks in using the facilities and premises. Among these risks are possible trips, falls, collisions with other people or objects, etc. You specifically acknowledge the existence of these risks and agree to the use of the premises and facilities with the full understanding of the same. That if you or your property are injured while using the premises and facilities as a result of the inherent risks and dangers mentioned above, you agree to RELEASE, INDEMNIFY AND HOLD WHIRLYBALL HARMLESS FROM SAID INJURIES OR ANY COSTS OR EXPENSES ASSOCIATED THEREWITH EVEN IF THEY WERE CAUSED BY THE AFFIRMATIVE NEGLIGENCE OF WHIRLYBALL or any of its employees, agents, or representatives. 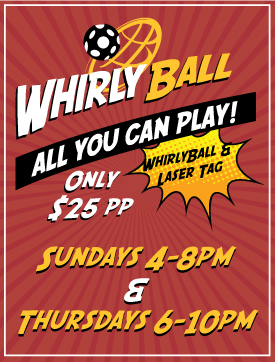 That you agree to obey all rules and regulations for the use of these facilities and premises, which are posted throughout the premises, and the directions, if any, given by WHIRLYBALL’S representatives either before, during or after use of the same. That you specifically agree to allow WHIRLYBALL to employ any images taken of you while on the premises for publicity purposes. That you acknowledge that you have reviewed the WhirlyBall Rules with your minor child and you are authorized to agree to the specific terms and conditions contained herein as the minor’s parent or guardian. ALL REFERNCES TO “WHIRLYBALL” IN THIS DOCUMENT SHALL INCLUDE SP INTERNATIONAL REAL ESTATE 6464, LLC AND SP WHIRLYDOME SERVICES, LLC. DO NOT SIGN THIS ACKNOWLEDGEMENT AND RELEASE UNLESS YOU HAVE READ IT AND UNDERSTAND IT. IF YOU DON’T UNDERSTAND IT, ASK A WHIRLYBALL REPRESENTATIVE FOR ASSISTANCE. Important! Failure to fill this out may result in your child not being able to play. Coming with a company or group?